We’re the place to meet, laugh and enjoy great food with great company. From anniversaries to baby showers to corporate events to weddings, we have semi-private and private spaces to accommodate it all! Located on 14th Street, two blocks from the U Street Metro. 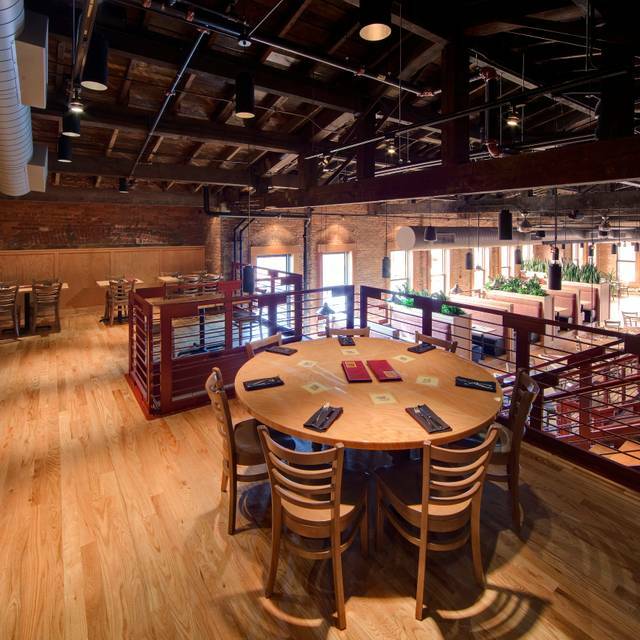 The third floor mezzanine accommodates 40 guests seated, or 60 guests standing, reception-style. Bubbling, thin crust pizzas, mini burgers, crisp salads, and craft cocktails...four great reasons to visit matchbox today. We’re the 14th Street neighborhood gathering place for fun, upscale casual dining, with local, award-winning beers, broad spectrum wines, and handcrafted signature cocktails you won’t find anywhere else. Three soaring levels mean plenty of space for intimate dinners, large parties and get-togethers. Every seat in the house has a unique perspective, but everyone is treated to dramatic views of the original exposed brick façade and perfectly-restored grand entrance. Built at the turn of the century, the 14th Street location has been reborn as a bowling alley, automobile showroom, rehearsal space for Arena Stage, and most importantly, Club Bali where Billie Holiday, Louis Armstrong, and Cab Calloway made history. As always, great people! Really like this place a lot! Excellent, excellent service! The food was great and prepared as requested. Food and service were superb. The room was very loud and tables tightly spaced. What a great time! Been coming here for 3 years and love this place. Also never knew they have a loyalty program (DEFINITELY CHECK IT OUT). As always great times. I worked with Kristina, she was professional and genuine! Ryan K. was very polite and had great suggestions. Also mentioned Matchbox is opening a new location in Silver Spring, Maryland! Michael Hartner came over and said hello, and it made me feel very welcome. He definitely knows how to treat individuals to make the experience that much better! Started out great, bread and garlic butter was outstanding. Arancini delicious, meatball was big and good but sauce too spicy. Just started appetizer and food came out. Timing was terrible between appetizers and dinner. Pizzas were just ok my burger over cooked and somehow arugula was used on my burger instead of lettuce, I don’t like arugula. Wanted cheesecake for dessert but it was frozen so we couldn’t have that but I will say the brownie was delicious. Just an ok experience and with all the restaurants in DC I will not be going back. After asking our server "what comes with the shrimp & grits" (mean a side salad, some bread, whatever) her response was "shrimp.....and grits". So I ordered a side salad. When the order was delivered, my salad was missing. I asked about it and she told me she wasn't clear on if I wanted it. (Strike 1). When I looked at my entree, there was a pitifully small portion of grits and way too much broth. I mentioned that I think I may have gotten the appetizer portion. She said "no...5 shrimp. That's the entree portion. Would you like more grits". I said yes and it took almost 15 minutes to be delivered. (Strike 2). After asking for a refill of my iced tea, that took almost 10 minutes. (Strike 3). Sorry Matchbox, you're out. Fun place for brunch with lots of variety. Enjoyed the endless bunch box and cocktails. Pound cake and blueberry muffin french toasts were excellent. We got arancini, matchbox meat pizza and the chicken main plate. The food was delicious. Went for happy hour. The food was great and good selection of beverage options. Would go again. Drinks took 20 min to arrive. Service slow and poor. They gave me regular pizza instead of gluten sensitive. I wrote an email to discuss this and they never responded. Great service and the expanded menu is awesome! I am really impressed! Hadn’t been in a while. One of my favorite pizza spots. The service and food were great!! Pizza was good but underwhelming. Service was very good. Restaurant has very modern fun layout. Good for social get together. I’ve been to this location a few times and always had a great experience. Having celiac disease means finding places that are safe (relatively) to eat at. The other times I’ve dined at this location, they had their GF crust. This time, it was 6:30 on a Saturday and relatively quiet. We sat down, had drinks, an appetizer, and ordered the GF pizza. Our server then came came back to our table and said they ran out of GF crust. I genuinely appreciated their efforts in trying to accommodate our dining experience. The manager was calling around other pizza locations to see if they had any frozen crusts, and then he even went to Trader Joe’s across the street to find one—which was truly valiant—however... the first ingredient on the packaging of the crust that he bought said, “WHEAT GLUTEN.” In the end, the manager paid for our drinks and appetizers which was very kind and much appreciated, but he clearly didn’t know what gluten was until I explained it. TLDR: if you are dining with a food allergy or celiac disease, emphasize what gluten or your allergy IS and any steps they need to take to keep you safe. Again, I have yet to get sick at a Matchbox, but from now on I will proceed with more caution. Our waiter Jordan wasn’t very attentive at all . We had to get water and condiments on two separate occasions from someone other than our waiter. Ordered burgers 3 with cheese 3 without all came with cheese. Told the manager (Paul who will be working in silver spring when that location opens) about it and he said well your other items have cheese on them why does it matter . Very flippant and smart I was appalled. I asked for 2 to go boxes cause I was over it. The actual manager of the location Kevin came over and was nicer than everyone we had encountered. He gave us some coupons towards future visits. Matchbox on 14th is one of our "go-to's" in the neighborhood for a casual meal out. It's a very pleasant place, the food is great and well-priced, and the staff are very friendly and customer-focused. Our server Mike was excellent! 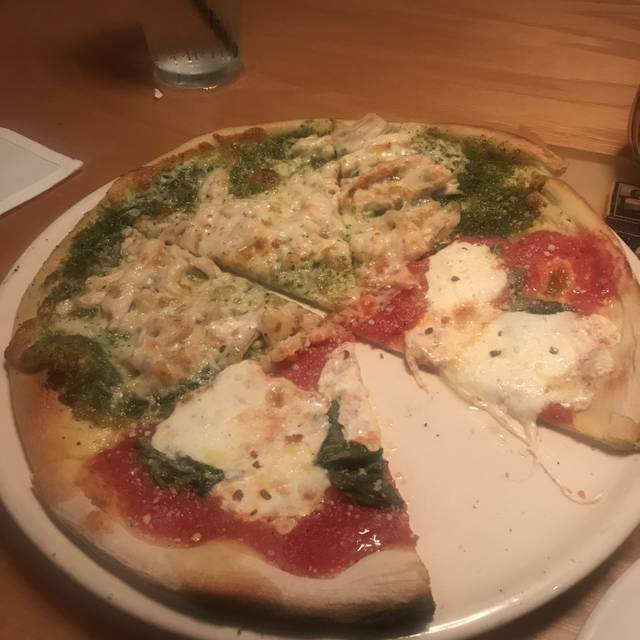 I had the pear salad and the chicken and pesto pizza- both were excellent! Apple and pear salad, mini burgers were great. The salads are big so no need to add anything else. Went on 01/23/19 and had to inform the front desk that Resturant Week was extended. therefore I requested the dinner menu and to my surprise one of the items pizza was not available on the menu. Why wouldn’t pizza be available on the dinner menu for restaurant week? Our server was Great!!! 2 hours. That is how long my friends and I waited before I did something I have never done -- I got up and left the restaurant. Let me start off by saying that I have visited this location many times: TWO of my birthday parties, multiple friend's birthdays, celebrations, regular lunches, brunches, and dinners. On this date (1/20/19) we were there to do a send off for a friend moving out of town. We had reservations and were seated upstairs in the walkway area in a booth. We should have known that this experience was not going to be great when it took 20-25 minutes for someone to greet us and take our beverage orders (tea, sodas, no alcoholic drinks this time). From then on two different servers took our order as one had to replace the other. Then, as time went on and no food came we spoke to a manager and then he took our order. When it approached the TWO HOUR mark of not receiving our meals my friends and I decided we should leave. On our way out I met with a manager named Michael Hartner who said he would compensate us by sending gift cards. So I sent him an email that night and it has been over 2.5 weeks and have not received a gift card. PLEASE BEWARE WHEN EATING HERE! Don't say I did NOT warn you. One of the hosts was busy socializing with co-workers rather than seating guests. We were seated next to bar, despite requesting a quiet table on-line. On-line brunch menu did not mention bottomless requirement. Server ignored us for first 10-15 minutes. Crabcake was undercooked and I got ill. Terrible experience overall. Always have a good experience here! Their pizza and cocktails are great. The brunch small plates menu is very nice, but it is the only option for breakfast food. It’s a one-price-all-you-can-eat. There are a lot of interesting dishes/plates. However, bring your appetite to get your money’s worth! The restaurant it self was great and the food we ordered was delicious! The attendees Kara was horrible, she was absolutely rude and I disliked the way she talked to all the people at my table. We observed her interactions with the other tables and she came back to them several times. At times we needed to find other workers to help us. We cut our dinner short and stop ordering because we were so disappointed in the way she interacted with us. She was short with her responses and seems frustrated that we had difficulty with the menu. We won’t be coming back to this matchbox. Love Matchbox. We had wine with calamari as an appetizer. Then shared the excellent Pesto Pizza. Yum. Only complaint I had was we were near a side door that people kept using to exit that didn't always close well, and my companion was a bit chilled and I pulled it closed a few times. Our server was very attentive of our needs and did a great job on serving us. 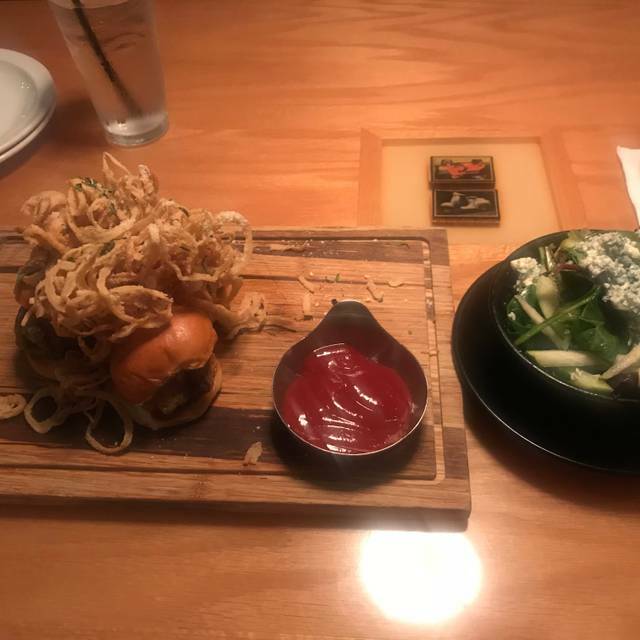 I hadn't been to Matchbox in sometime, but I was disappointed as I remember it being better. The pizza was really greasy (with too much pepperoni), and just not that good overall. It was also really expensive for what I ordered. Not planning to return anytime soon, when I think there is much better pizza in DC (see, All Purpose or Timber). The bar tenders are great. This time we had Ben that was very lively and very good at making the drinks. The manger Brandon was also very helpful, not only to the patrons but also to his staff. That's is a great leader. Service was good but unfortunately there was hair baked into the bread of our spinach artichoke dip. Our waitress was really nice about it but it kind of ruined the whole experience. The pizza was not really that spectacular either, not bad just not something to write home about. Their new BrunchBox offering is can't miss- order the shrimp and grits, biscuits, and the cinnamon rolls, for sure. Been coming for years. The pizza was rather soggy. Not as crisp as it used to be. Delicious pizza and an incredible calamari!!! !